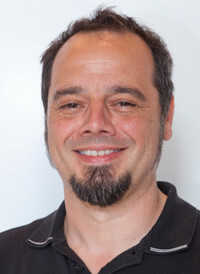 Frank has been interaction design professional for more than twenty years. He teaches at the Amsterdam University of Applied Sciences since 2007. Prototyping is Frank's passion, and he believes it should be core skill for any designer. Until recently, he was called an "autodidact" (in the prototyping spirit of learning by doing), but eventually got his degree in communication and multimedia design. This was also an experience in being the user (he knows what it means to be a student in 2015).